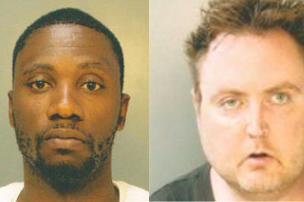 Jerome Bogerty, 33, of the 6300 block of Farnsworth Street, and Jeffrey Brett, 37, of the 9700 block of Lockwood Road. Two Northeast Philadelphia men are facing criminal charges for the alleged straw-purchases and illegal transfers of 11 semi-automatic handguns bought from three different shops in the city, the state attorney general's office announced Monday. An investigation was opened earlier this year after police received a tip from Locks Gun Shop in Northeast Philadelphia. Employees at the shop noticed Jeffrey Brett, 37, purchased three handguns at the store before turning them over in a nearby parking lot to a man later identified as 33-year-old Jerome Bogerty, according to prosecutors. Bogerty is a convicted felon who is not legally permitted to possess a firearm. Investigators tracked eight other alleged straw purchases at two other gun shops not long after the original tip. Authorities executed a search warrant on Bogerty's residence and allegedly found cocaine, heroin, two ballistic vests and more than $2,000 in cash, in addition to the 11 loaded firearms. A 12th gun, a Glock 9MM semi-automatic handgun, contained 30 live rounds. The charges come as Pennsylvania Attorney General Josh Shapiro works to stem the flow of gun trafficking in Philadelphia and other crime centers. His gun violence task force has seized more than 150 guns in the past year and is looking to expand into more cities, including Chester, Carlisle and Hazelton. Brett and Bogerty have been charged with weapons offenses, making unsworn falsifications to authorities and tampering with official records. They are being held in Philadelphia County Prison on $1,000,000 bail each. Preliminary hearings for both are scheduled to take place this month.